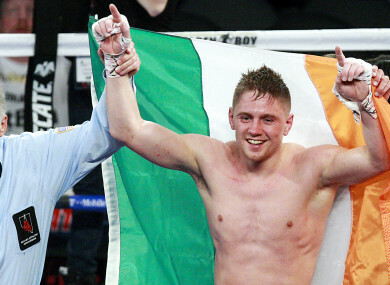 JASON QUIGLEY FOUND himself in a battle but ultimately left the ring with a unanimous-decision win over veteran Freddy Herandez on frankly disgraceful scorecards of 99-91 and 98-92 x2. Quigley was deservedly awarded the win but there can’t have been more than a couple of rounds in it after the 39-year-old former world title challenger pushed him to the edge at Fantasy Springs in California. The Donegal middleweight, formerly known as ‘El Animal’, opened with a couple of sharp right hands through the guard in the first before tidying up somewhat in the second, working behind an accurate body attack and stinging jab. He took the third, as well, but at a pace that afforded Herandez plenty of breathing space: the left hook we saw fell the previously unstopped Daniel Rosario was non-existent, and Hernandez edged the fourth, opening a cut beneath the left eye of Quigley. An accidental clash of heads opened up a corresponding blemish for Hernandez, but the veteran manoeuvred his way back into the contest with a strong fifth. Hernandez caught Quigley flush with an overhand right to start the sixth, and it wouldn’t be an exaggeration to claim he controlled the round overall from that point. He rattled Quigley with another peach of a right against the ropes a round later, and completed the better work overall as it became apparent that he had showed up in California looking not merely to survive, but for a scalp. Quigley tried to initiate the exchanges in the eighth but again it was Hernandez who landed the first shot clean — a right hand on the back of a standard one-two. Quigley, though, began to find his rhythm in the counter, picking off an overzealous Hernandez with a couple of tasty shots on the backfoot. In the penultimate round, it was Quigley who landed first in anger with the left hand, but there wasn’t much to separate them. Again, Hernandez landed a few of his own, and Quigley tried to force it — finding little to no success with his right hand. The Irishman had the better of the last, outboxing Hernandez in a manner that begged the question as to why he hadn’t fought similarly sooner. 10 rounds in, Quigley’s head movement was decent, his counters found the target, and there was one peach of a left hook to the body which momentarily gave Hernandez something to think about. But there will be more for the Donegal man to think about after what was ultimately a lacklustre display. It was only Quigley’s 15th professional contest and Hernandez had boxed 203 more rounds than the former Irish amateur breakout coming into tonight’s bout, but the younger fighter could have made that count and instead let it work against him for plenty of the fight. He won, sure enough — the punch stats will tell you that — but there is massive work to be done over his next few fights if he is to establish himself as a world title contender. Email “Quigley emerges victorious after serious scrap with veteran Hernandez”. Feedback on “Quigley emerges victorious after serious scrap with veteran Hernandez”.